Digital technology is transforming economies and the world of work in profound ways. Traditional jobs are being transformed while new forms of work are being created. The discussion explored how the South African market needs to prepare young people in order to access employment opportunities in the fourth industrial revolution. Digital skills can be categorised into two groups; sophisticated skills and point of entry skills. Sophisticated digital skills were defined as the ability to add value to existing technologies – like the creators of Uber – in which different software and technologies were integrated, while they were responsible for the unique value proposition turning it into something unique. This skill requires familiarity with digital technology, ability to continuously learn and adapt as well as a deep awareness of what’s happening in the world. Entry level skills on the other hand are basic digital skills that create access points to employment opportunities. As the world of work evolves, traditional jobs increasingly use digital technology in their daily operations. 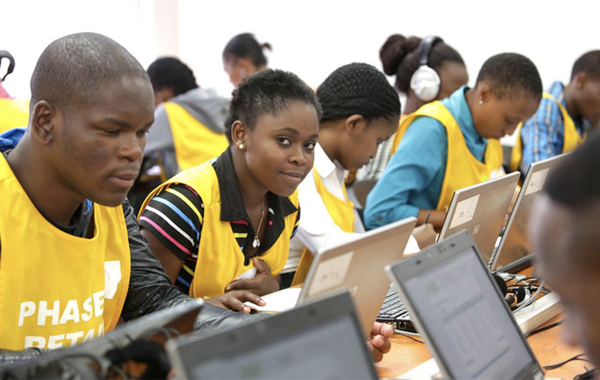 The digital skills of South African youth, both sophisticated and entry-level, are still marginally behind those of youth in other developing countries and it is important to understand the context in order to develop recommendation to address the problem. The majority of young people in South Africa who have grown up in poverty have a debilitating fear of failure that prevents them from trying new things, particularly in the area of digital technology. Poverty restricts young people’s ability to innovate and take risks because their options are fewer and the costs associated with failure are high. In a country where a large proportion of the population lives in poverty, young people are in need of intrinsic motivation and confidence. Confidence creates change, facilitates curiosity and innovation and allows young people to take risks – including using exploring with technology. Confidence is built when young people do something, they didn’t think they could do and in order to grow and scale confidence, the government, NGO’s and programme implementers need to provide a conducive environment for this to happen. The high price of data in South Africa reduces young people’s access and limits their exploratory capability. The strength of telecommunications regulators in South Africa and the lack of state political will to intervene are some of the reasons why the cost of data remains high. Access breeds the ability to explore and necessitates the need for free (or at a much reduced cost) and high-quality internet through municipal WiFi, free applications and state intervention were discussed as opportunities that could open up young peoples’ ability to build the skills required in the changing global economy. In addition to this, there are environmental issues that may be hindering South Africa’s ability to move forward in the space of digital technology. Smart phone penetration remains lower than global averages at just over 40%. Given that smart phones are often the first entry point into the world of digital technology and the opportunities presented, it is concerning that the majority of the youth in South Africa not have access. Security and crime are also big challenges in South Africa; an example was shared in which employees are provided with free WiFi at work but don’t bring their smart phones to work because of the likelihood that they will be stolen in transit. South Africa’s education system is still based archaic teaching methods and traditions. Innovation, creativity and exploration are not actively encouraged and school-based computer driven learning is not fostering self-directed learning and curiosity. Institutionalized thinking in the education system is a barrier to new teaching methods critical for imparting digital skills and teaching the ability to learn. In many cases, the teachers’ digital proficiency is much lower than that of their students and as such, they cannot teach what they don’t know. In addition, the prevalence of digital technologies, particularly in rural and township schools is low, which further reinforces the status quo and widens the inequality gap. The challenges are complex and they require a multi-dimensional set of solutions that involves a coordinated effort from industry and government. We may not get there immediately but there are small things that we can do to shift the dial. Give young people a sense of belonging. It was not beyond the group that these points are in many ways, not exclusive to digital skills – but are fundamental for the growth and development of a youth cohort that is able to operate in the 21st century and the fourth industrial revolution.